One woman drafts a lengthy contract detailing 22 requirements for her boyfriend to sign. Some that include banning him against hanging out with his friends more than twice a week. 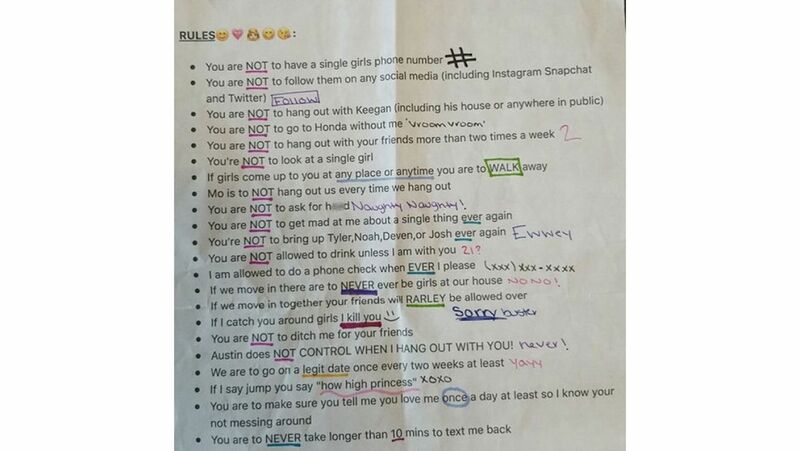 The list was first shared on Twitter by a guy who found it in a used car he had purchased, but he then deleted it because people thought it was his own girlfriend who had made it and she was being harassed, according to The Daily Mirror. The list has since resurfaced online after BoredPanda shared images of it along with comments from horrified readers. Austin does NOT CONTROL WHEN I HANG OUT WITH YOU! You are to NEVER take longer than 10 mins to text me back. "She sounds crazy but it also sounds like he cheated and she took him back,” someone commented. By Michelle Gant is a writer and editor for Fox News Lifestyle.